Finally after carrying 80 some photos on my cell phone for close to a year my son-in law helped me down load them to may computer. I am not completely tech illiterate but being a new phone and with all the bells and whistles which I do not use it was confusing. 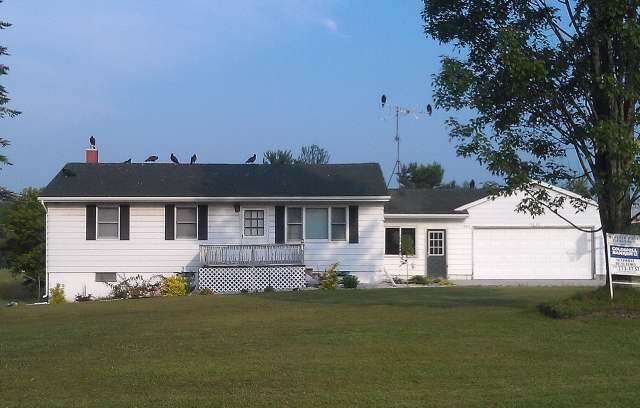 We were traveling to Harrison early one morning for a score match when after passing an intersection I looked to my left where I noticed 13 vultures perched on the roof of this house. My passenger said OMG…… that is creepy! I turned the Yukon around, grabbed my phone and snapped 3 pictures………..for the next 20 miles or so we had quite an interesting conversation with many jokes. It appears that they had been there for some time for the roof was white washed with pooh, there are only 10 in the pic but there were a total of 13. This is just another interesting photo caught at an unscripted time and one of the best parts of it is that the house is for sale!